branches old fence, originally uploaded by jahansell. I feel bad posting this. It's a snowy landscape. I think we've all seen enough of these. I should do as Rick did on Facebook yesterday and post a pretty summer scene. The only thing new and different to shoot around here today is the brown dirty snow piled up by every driveway, and I really don't feel like doing that. Icicles? OK, I could try that, but...yawn. I've gotten a bit obsessive about checking the weather forecasts - I have three weather apps on my phone, and I check them constantly to see how much snow we're getting in the next round. If you do this too, you owe it to yourself to visit Gawker.com and read the story about Accuweather maps. 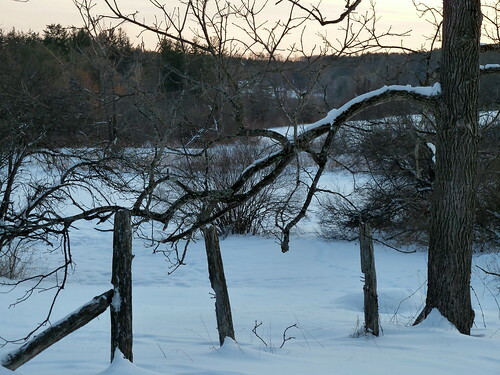 It's a lovely country scene with the broken fence - artsy and wintery! Love it!